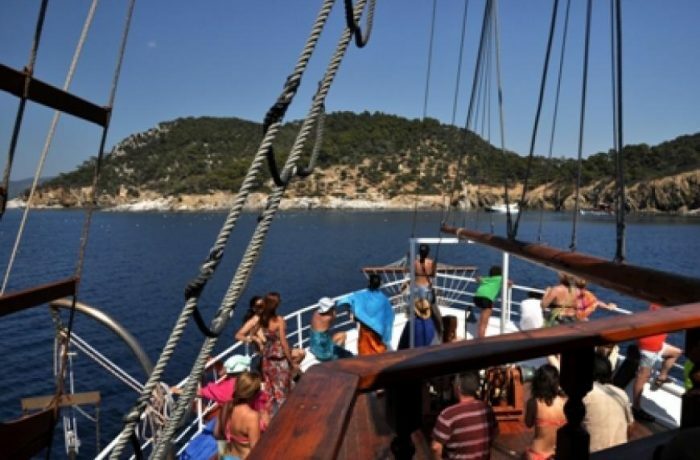 If you are visiting the northern part of Sithonia, you can enjoy one funny full day swimming cruises and sunset tours! 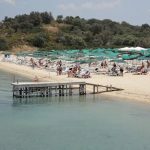 The 1st tour begins from the small port of Sarti in the morning by boat with destination the northern part of Sithonia where you will have the opportunity to jump into the open sea and enjoy the marvellous beaches of Vourvourou, Diaporos island and Kavourotripes. 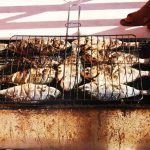 In the evening on the way back, you will make one last stop where you will prepare along with the captain, the grill and salads drinking wine and we promise you an unforgettable cruise with unlimited wine and lot of fun. 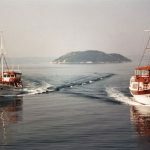 The 2nd tour is the famous boat cruise to Mount Athos, the 1.000 years old Monastic Community on the third and eastern peninsula of Halkidiki. 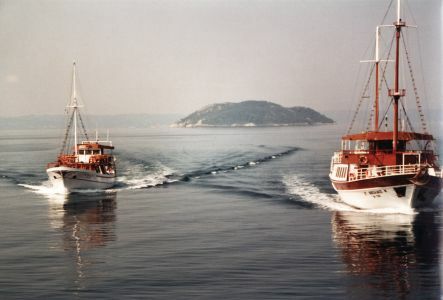 Mount Athos The cruise starts from the port of Sarti sailing directly to the southest point of the peninsula Athos. Visitors will have the chance to admire numerous hermitages built on this part. Then the boat turns and goes closer to the shores offering breathtaking views of the monasteries. There are multilingual guides that explain and bring you closer to the history of orthodoxy, the monastic life and to the monasteries. After that, the boat will take you to the only populated island of Halkidiki, called Ammouliani. You will have free time for a couple of hours to stroll around the village, swim at the most exotic beaches of Halkidiki and taste the authentic Greek cuisine. The tour ends around 17.00 at Sarti. The 3rd tour begins from Sarti at noon for a funny and adventurous trip by boat. First stop is at Portokali beach or Kavourotrypes beach, one of the most beautiful and photogenic beaches in Halkidiki! The second stop will be at the bay of Vourvourou where a complex of 6 little islets (Diaporos islands) is located. Here, you can swim, snorkel or just relax on your own "private" beach. Final stop at the lovely beach of Rhodia. Final chance to swim and enjoy the sun before having lunch. The crew prepares the lunch for you and when everything is ready we enjoy eating altogether. Keep some of your energy for the way back, there will definately be dancing on the way back! The 4th tour is a day trip to Ammouliani island, a small hidden paradise with the most exotic beaches that you can imagine! 4 words can try to describe our own little island: traditional, virgin, authentic, delicious! The 5th tour is a romantic sunset boat cruise! This tour starts at 18.00 and returns at 21.00 at Sarti. If you don't like the hot midday sun and wish for an afternoon cruise along with stops for swimming, then this is ideal for you! After 2 swimming stops to Klimataria beach and Pigadaki, the charming harbour of Sykia where you will have free time to have a drink or coffee, you will head back with the view to the magnificent sunset listening to the music heading to our final destination the small port of Sarti from where you began. The last tour takes you around the Toroneos Gulf which is located between Sithonia and Kassandra peninsula. This is a fun tour to the crystal waters of the Toroneos Gulf with destination the peninsula of Kassandra. 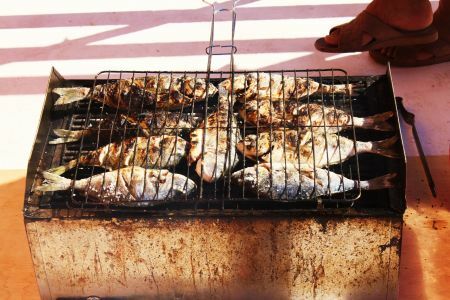 Fabulous views and beautiful beaches, BBQ on board, a visit to the Kelifos Island (or Turtle island) and the Pefkochori village are included in this memorable tour!